In a couple of weeks my family and I will be taking a road trip to Wyoming for a little over a week to visit family and attend a wedding. We drove from Illinois to Wyoming last year also. This year we are going to stop at Yellowstone National Park for a day or two before going to our destination. 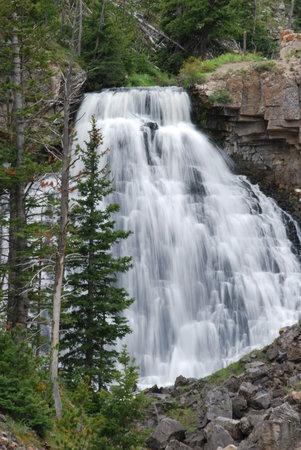 Yellowstone is a huge national park that extends across Wyoming, Montana, and Idaho. I’m super excited because we will stay in a cabin in the park and live a very simple life while there (food cooked over open fire, no phone, t.v. or internet in our cabin). Very rustic and I likey. I love being outdoors and I love unadulterated nature so I am going to bask in hippieness, lol. Now, we will be in the mountains so it will be cooler (around 60-70 degrees) which will make us temporarily forget that it is summer. I don’t mind. I hope to take some hikes and observe the animals, trees, mountains, and active volcanoes that the park stores. We will have a stroller, baby pack, and a child leash (which I don’t like, but I have to keep my baby away from the lava!) for Lanona so that she stays safe. Categories: family, personal, travel, trips | Permalink. Have a great time with your family and other relatives and friends! Please let me know when you're taking off! I'll want to call you. You sound pretty prepped! I love the child leash bit. Nona's not going to appreciate it one bit! “Mama, I was just going to find you some pumice rock, it's natural!” hehe.